Sutton-in-Craven is sited on the southern edge of the Airedale valley, on a shallow terrace where Sutton Beck combines with Holme Beck before joining the River Aire. 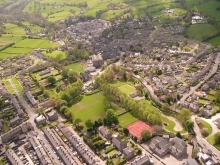 It is approximately equidistant between the towns of Skipton and Keighley. The reason for the initial settlement is not clear but the area was excellent for farming and natural springs could be found around Sutton. Sutton is first mentioned in the Domesday Book, dated 1086, where it states that the land of Sutton and the surrounding area belonged to the crown. In the years after 1086 the land was given away/sold to a Norman Knight called Robert de Romille by William. Later the land was passed onto Edmund de Boyvill and then from him to Adam de Copley. Clearly there must have been a strong Norman presence and influence around Sutton. Farming was the main occupation until the mid 18th century � The Industrial Revolution! This brought big changes to Sutton especially when the Leeds Liverpool canal passed through in 1773 and the railway in 1846. The percentage of people living off the land dramatically declined and most people now earned their living working in the mills that had sprung up over the area. The main mill in Sutton was located just behind Crofters Mill development, where the Silent Night building used to be. This area of Sutton has some of the oldest buildings which used to house many mill workers and their families. The village expanded in the 19th Century as an industrial mill town. The Park is of pivotal importance in the village. 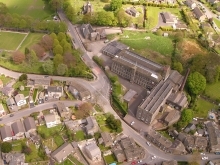 Like a village green, it has many key community buildings on its fringe notably the church, primary schools, mill and a pub.